UNDER CONSTRUCTION - Watch for bumps in the road! Our house is highly populated with various eclectic collections. Every room is designed with shelving to showcase my current favorite items. I’ve always liked visiting antique stores and malls and stopping at thrift sales and flea markets, but the discovery of eBay and the vast selection it offers was a turning point in my collecting career. "Click" on images to see larger view. "Click" on links below to see a series of images depicting a specific collection. Bowls, in a variety of styles and materials, were my original collecting passion. I started accumulating them after I graduated from college in the late 1960’s and amassed several dozen over the years. While I eventually pared down the quantity to a more reasonable number (they take up a LOT of display space! ), I still own a nice representative selection from my original more extensive collection. Many examples hold special memories, and I still enjoy gazing at them every day, though I rarely add more. As my bowl collection started to overflow my display spaces, I started looking for something smaller and more easily found at the venues I liked to visit. I ended up with a wide variety of small boxes. Eventually I accumulated larger wood boxes, too, as I love inlay, pyrography (wood-burning), and carving. 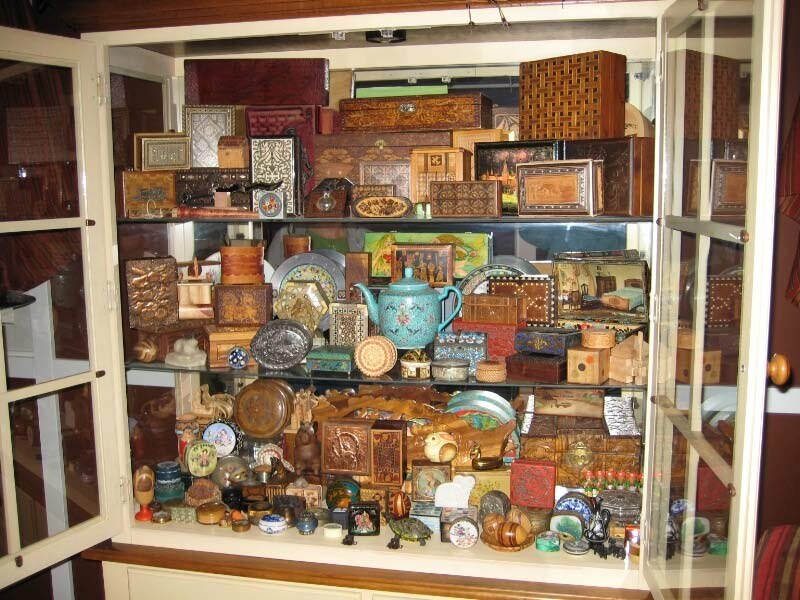 The charm of boxes is that you can store other collectible items inside them, if need be, plus the variety of sizes, materials, finishes shapes, etc. is endless. I also discovered that what’s inside some boxes is even more interesting than the outside. 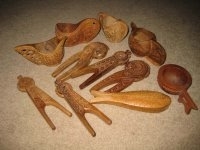 After receiving a chip-carved box as a present, I started actively looking for chip-carved items. I’ve found lots of boxes, shepherd’s cups, and nutcrackers, but have also found a desk set, plates, salt and pepper shakers, etc. My favorite finds are a chip-carved cupboard and a small buffet cabinet, both in heavily carved walnut. 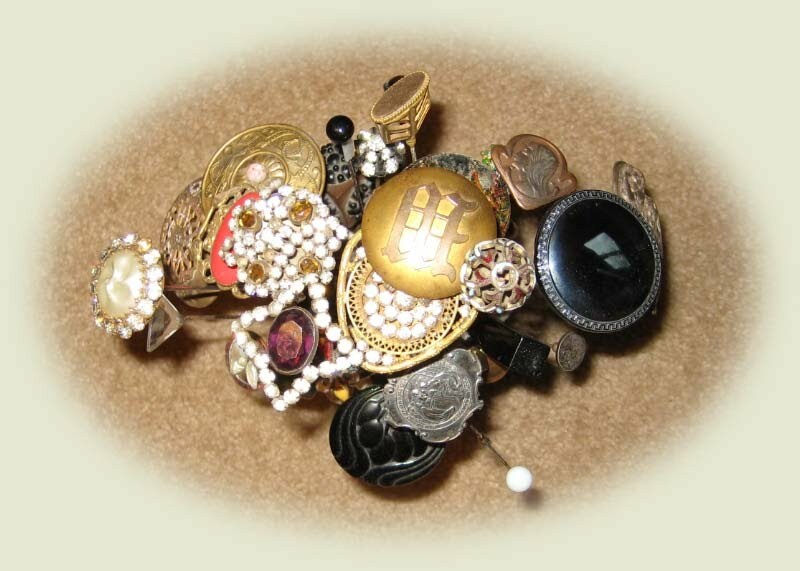 Hatpins were my mother’s passion. 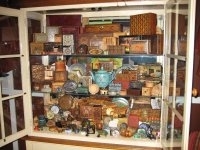 She collected them for several decades when no one else was interested in them and they tended to cost 50 cents to $3. She always had room for new ones. When she died, she had over 400 of them, so each of her children received a portion of her collection. They’re a great item to collect as huge numbers fit in a very small space. 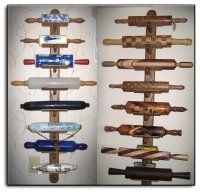 Ten years ago I had 2 friends who collected rolling pins, so started looking for pins as potential gifts. I ended up with several on hand, put them into a basket, and started actively collecting them. 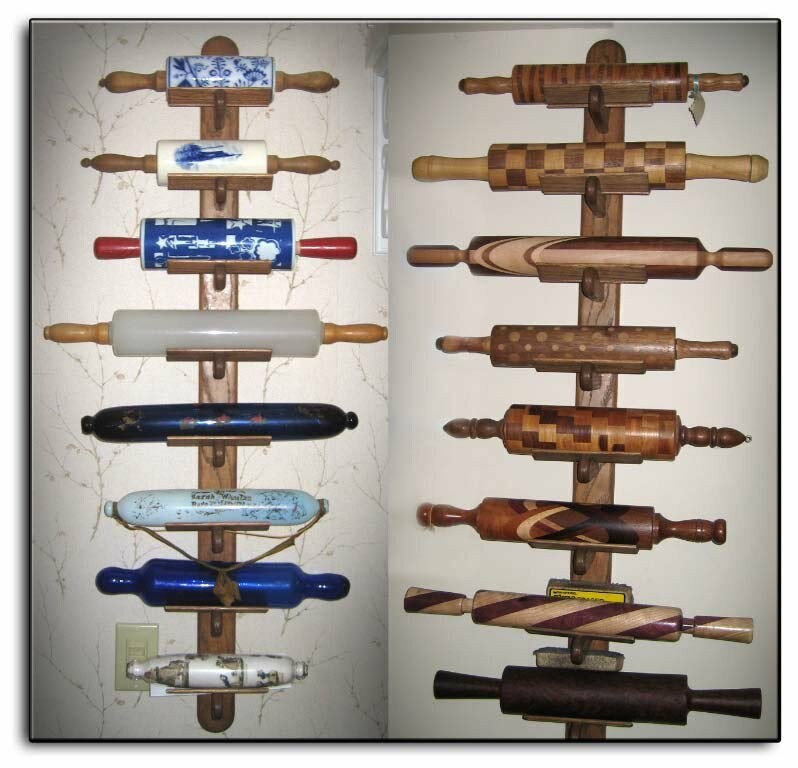 I had a nice satisfying collection of 20+ wood ones when I unfortunately discovered eBay…and its daily selection of 1600 different rolling pins, in a huge array of materials and styles. I’d never even realized some of those pins were out there, but I’ve had a fine time trying to acquire representative models ever since. I don’t have one of everything, but I do have a great selection of strange or wondrous and downright beautiful examples…and I’m never at a loss for a rolling pin if I’m baking pies, making lefsa, etc. For years I’ve loved looking at antique beaded purses when I was browsing through antique malls. The artistry and designs were simply amazing…but so were the prices, so I always admired and passed by. 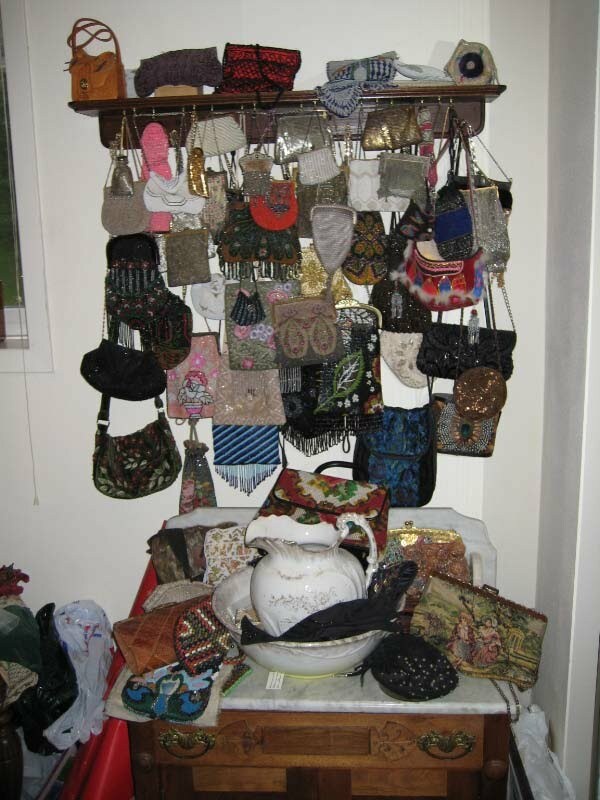 On a whim I looked them up on eBay and spotted a lot of 7 beaded purses with a starting bid of $10. I put in a bid, and no one bid against me, so I got the whole kit and caboodle for $10 plus postage. I ended up with a ready made collection, as 5 of the 7 were pretty nice. Over the years, I’ve pounced on several additional eBay bargains, plus I’ve found some low-priced beauties at the flea market and thrift sales. (The DC Big Flea was riddled with bargain beaded bags when we visited.) I’ve also found some oddities: a walrus fur bag, a wallet made from sliced corn cob “pennies”, a feathered shoulder bag, a leather saddle purse, etc. that I added to the mix. So, I have a fun collection of simply gorgeous purses enlivening our formerly plain bedroom wall. I’ve also had a great time loaning out the newer ones (the old ones tend to lose beads and are fragile) to friends for special occasions. The past couple years I’ve gotten interested in wooden gameboards. This is pretty much a thrift sale collection as I try to keep under my $5 limit--just for the challenge. My array includes both old and new examples. The graphics and workmanship (many are hand-made) make it an interesting display in the spare bedroom. Watch for photos coming soon! 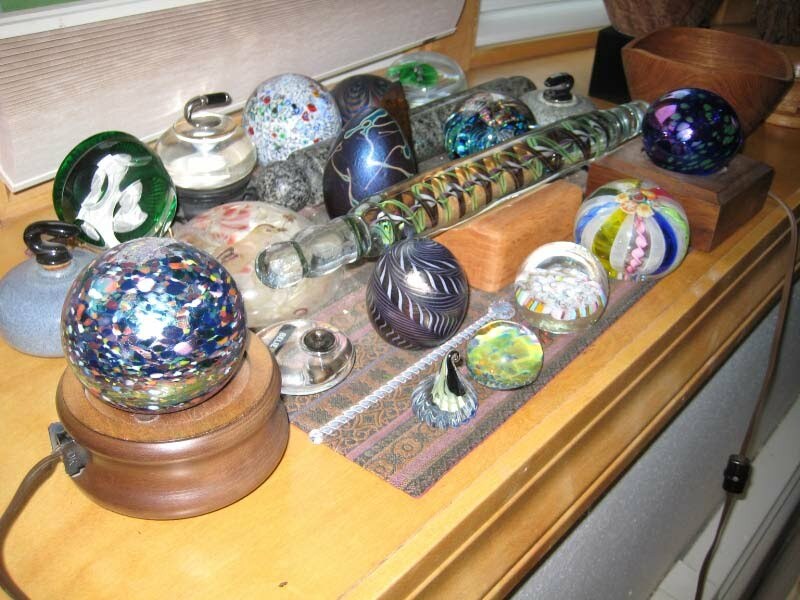 I never intended to collect paperweights. My mother-in-law loved them and I always accumulated them ahead of time for her birthdays, Christmas, etc. When she died, I had a large number on hand, so started displaying them. 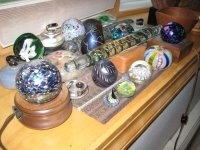 I added a few more from the flea market, the Mahler paperweight museum in Appleton, etc. and voila! :I had a collection! My array is small but has samples of the many varieties of paper weights available and the vast creativity of the artists making them.